Yusaku Hanakuma is a Japanese illustrator and cartoonist living in Tokyo. He studied at the premier Setsu Mode Seminar in Tokyo, and is the winner of numerous manga awards, including the GARO Magazine Nagai Katsuichi Award and the 13th Annual Manga Award for Excellence. 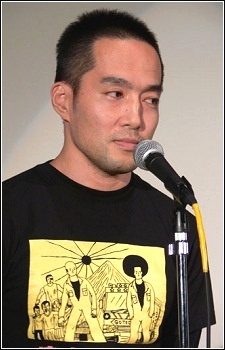 Hanakuma is famous for his heta uma style (literally, "Bad, but Good") of kinetic and grotesque illustration, and has released numerous titles in Japan, featuring his hapless characters AFRO and HAGE ("Baldie"). In addition to his cult fame as a cartoonist, Hanakuma is a skilled martial artist with a brown belt in Brazilian Jiu-Jitsu, and writes columns on the sport for a variety of publications.